Peter Macgregor was born in Govan, Lanarkshire (probably Meadowside House, Partick) on 21st February 1857, the son of John Macgregor and his second wife Margaret York. John Macgregor was a shipbuilder and partner in the firm “Tod and Macgregor”, but died on 23rd September 1858 when Peter was less than two years old. He studied at St Edmund Hall, Oxford 17 October 1874 - 7 November 1879 (He paid the fees then, so he may have studied until June 1880). He paid his MA fees on 3 June 1881 and received his Bachelor of (Civil) Law on 23rd June 1883. There are a few notes about the various subjects that he studied which included Aristotle, Xenophon, and Cicero, in addition to which he would no doubt have done exercises in Latin and almost certainly Greek. In March 1878 he stumped up 5/3d (five shillings and three pence if you too young to recall the old coinage!) to replace a lost library book. He took pupilage Middle Temple in 1876 and was called to the Bar on 21st June 1882. There is no evidence that he ever practiced as a barrister, but he used the title extensively during his life. Peter married Christiania Jennings on the 20th August 1890 at St Barnabas, Pimlico and in the presence of Richard Edmonds and Mary Hinse. Peter's address then was 162 Ebury Street, Victoria. Christiania's was 29 Ravensden Street, Kennington. She had been married before and her original maiden name was Hubbard. She had a daughter from the first marriage called Muriel Jennings (born 8th June 1886, in Kennington). 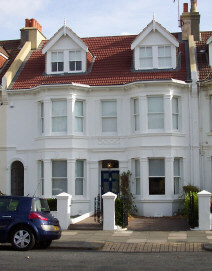 Although they lived mostly on the south coast, Worthing, Shoreham and Hove, Peter kept a property in Glasgow; 3 Park Street West, which he sometimes used. Christiania died of typhoid on the 11th of July 1899 in Rutland Road, Hove. Her sister Edith looked after the children prior to Peter’s death, and she brought up Muriel after he had died. Peter Macgregor died of a brain tumour at Hunston, Rutland Gardens, Hove, Sussex at 2.15am 22nd April 1901. He is buried at St Leonard's Aldrington. William York Macgregor, his brother, took responsibility for his young orphans after he died. They were moved up to Scotland and the eldest two studied at Dollar Academy. Claude studied at Edinburgh Academy.